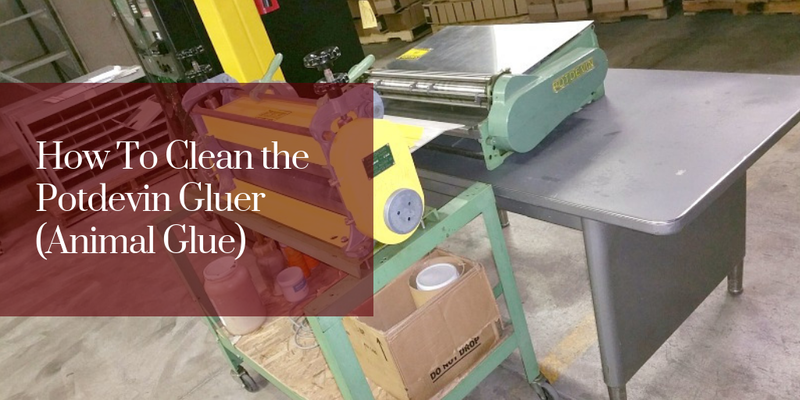 Potdevin gluing equipment has been around since 1896, so it's no wonder many of our printing and laminating customers use these machines (and have for many years). One question we get pretty often is: what is the best way to clean animal glue (hot glue) from the Potdevin glue tray? Ideally, the best practice would be to completely clean the machine each and every day. If that were to be done, we would recommend our M12 Release Cote. Release Cote is a scientifically compounded preparation which prevents coatings, like animal glue, from adhering to the walls of pots, ink fountains, spray booths, tanks, or any exposed surface. It is applied with a rag or brush before filling your machine. At clean-up time, after reservoirs are drained, residue is removed by a simple stripping operation. Release-Cote can be applied to spray booth walls, tanks, side scrapers and journals, ink fountains or any exposed surface where coating build-up occurs. This releasing agent puts an oil based coating between the glue and the tank and allows for a much easier rinse. One caveat to keep in mind: Potdevin has never tested Release Cote with glue that hardens and softens over multiple gluing operations. It could possibly lose its effectiveness, which of course would just be a waste of resources. Always be sure to use fresh glue, and to keep the machine as clean as possible. Another tip to keeping the machine clean is to make sure any hardened glue on the rollers or journals and scrapers are completely liquid again before running, otherwise gear damage and bearing damage is likely if this precaution is not taken prior to engaging the machine. Hot water usually does the trick to clean directly after work is done, but in the event glue has hardened, a solvent is sometimes necessary. Blue Bear Mastic Remover is a good one that we use in-house at Potdevin. It's easy to overlook equipment cleaning and maintenance, but in the longrun you won't regret taking the extra steps necessary to extend the life of your machine. A clean machine means cleaner glue, and an even cleaner end product. If you have any questions about cleaning your Potdevin equipment, feel free to reach out to us or Potdevin to learn more.